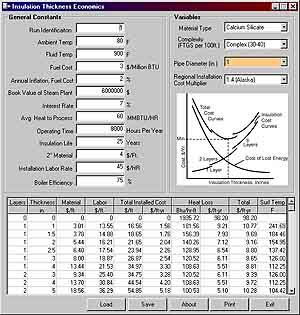 This program calculates the heat loss and surface temperature of an insulated pipe of specified diameter and internal temperature. It then calculates the present worth cost, dollars/ft., to own and operate each insulated system. This allows the user to select the optimum insulation thickness for each pipe based either on the cost of the insulation and heat loss or on the maximum acceptable surface temperature. Four types of insulation are supported. Pipe sizes through 36 in. are included. Three layers of insulation are supported ranging in thickness from 0 to 10 in. CU Services LLC, 725 Parkview Circle, Elk Grove, IL 60007. Tel: 847-439-2303.